IT efficiency. Business innovation. Sometimes these two goals seem mutually opposing. What if you could, by taking advantage of the cloud, drive both: improve the cost effectiveness of your IT portfolio and apply innovation to drive new revenue for your business? You can. In a webinar next week, my colleague Eduardo Kassner, Microsoft’s Worldwide Director of Cloud Solution Architecture and Barry Briggs, former CTO of Microsoft IT, will talk about how. As many have said, of course, the cloud is a journey which includes the use of SaaS applications such as Office365, migration of on-premises applications to the cloud, and utilization of cloud services to bring entirely new kinds of functionality such as machine learning and big data and many others to improve your business. It’s a significant undertaking and a best practice, one well understood by IT professionals, involves building a roadmap. What benefits should you expect to realize by adopting cloud technologies? Which applications will you move first to the cloud? Who should be involved in the decision-making and governance? What new roles are needed as the transition occurs? How can you best take advantage of the rich functionality found in SaaS applications? 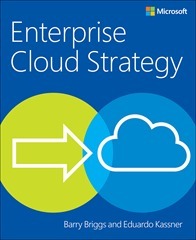 Earlier in the year, Eduardo and Barry published Enterprise Cloud Strategy, a free download from Microsoft Press. It’s a book that’s based on the real-world experiences of Azure customers and of Microsoft itself – by practitioners for practitioners. Judging from the response, many of you are thinking about moving your enterprise to the cloud (we’ve had over 50,000 downloads so far). Thank you, and if you haven’t read Enterprise Cloud Strategy, please download -- it’s free! Eduardo and Barry hope you’ll be able to join them on Wednesday, July 20 at 10:00 am PDT– we’re looking forward to it and hearing from you. Have cloud strategy questions that just can’t wait? Ask away in the comments section below.